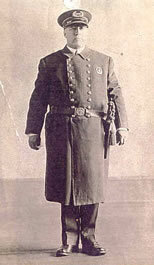 A formal studio photograph of Chief James Seibert. 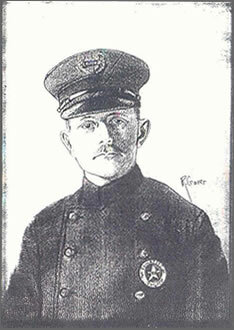 Seibert was Chief of Police from 1916 to 1922. Both of the photos were found in the records storage vault at the Borough Municipal Building. 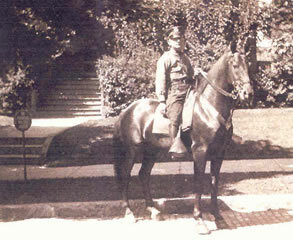 This photo is believed to be Chief Webster W. Cupp on horseback, posed across the street from the old borough building. Photo was taken between 1923 and 1927. This brick building pictured was the original borough building at 121 West Union Street that housed the police department, the fire department and borough offices. 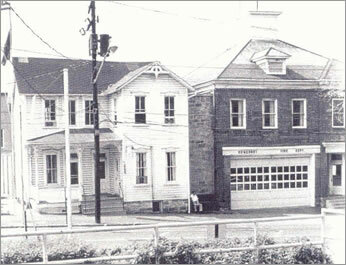 In 1942, the first addition was made to the building enlarging the fire department headquarters. The second addition was made in 1935 to provide a new lock-up and garage space. In more recent years the adjoining frame structure was acquired for various borough offices, including the police department. The current borough building was built in 1969. 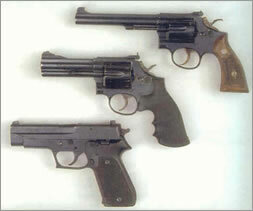 Pictured here are S.P.D. 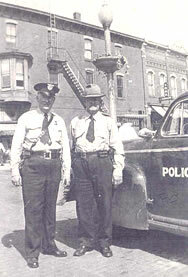 Officer Bill Layton on the left and Somerset Constable Ed Peck on the right.They are standing beside a Nash police car. Time of the photo is probably mid to late 40's. They are on the NE corner of the Diamond (Center and Main). 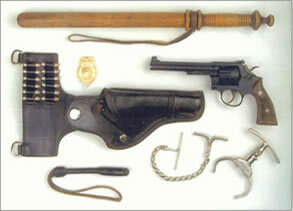 The Constable often worked with and assisted Somerset officers and more or less filled in when the police force was short handed. 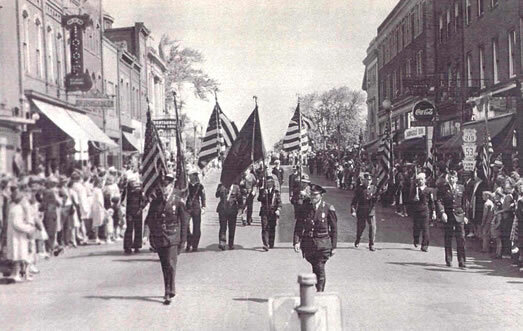 This ia a photograph of the lead units of the 1946 Memorial Day Parade in Somerset. On the left is Officer David Metzgar and on the right is Officer Paul Jones who appear to be leading the parade. The photo was taken looking north on the 100 block of North Center Avenue, with the parade approaching the diamond. 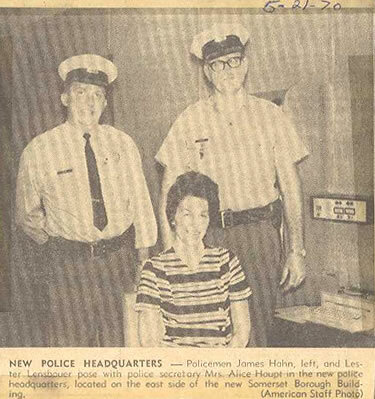 Left; This is a newspaper photo of policewoman Alice Houpt taken in the late 1966. Officer Houpt was a S.P.D. 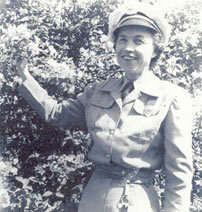 officer and Somerset County's first policewoman. 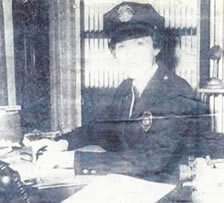 She was appointed to the force in March 1957 and served the department for 20 years. 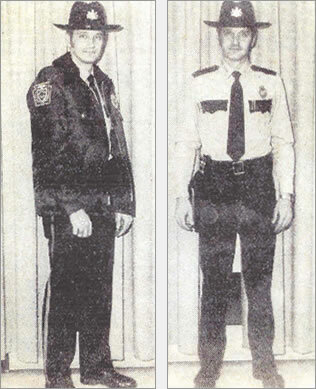 The other photos are also of officer Houpt in what appears to be a winter uniform (left) and a summer uniform (right). This is a very early shoulder patch that was worn in the 1940's and the 1950's. 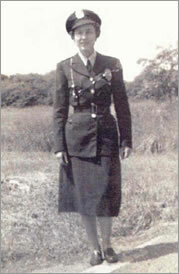 The patch shown belonged to policewoman Alice Houpt. This photograph was probably taken in September 1960 by Somerset photographer, Walter Bowen. The officers are standing in front of the old Borough Building that was located on the 100 block of West Union Street. 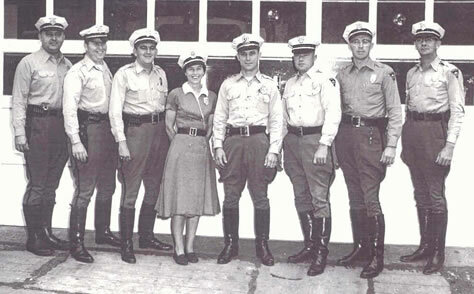 The officers are L-R; George Jock, Earl Thomas, Harold Hoggard, Alice Houpt, Fred Pyle (Chief), Ray Latshaw, Alfred Broght and David Metzgar. This is the shoulder patch that appears on the uniforms in the photo on the left. The department was given $40 to spend on shoulder patches in June 1960. This is believed to be the first multi-colored patch worn by the S.P.D. officers.This patch is one of the very few known to exist and was acquired from a Missouri collector in 2003. 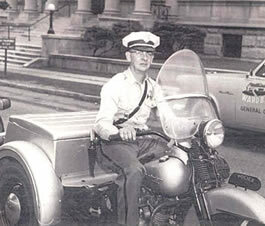 Photograph of David Metzgar riding the Police Department's Harley-Davidson "three-wheeler". Photo probably taken sometime in the early to mid 60's. Metzgar served as chief of Police 1963 - 1966. 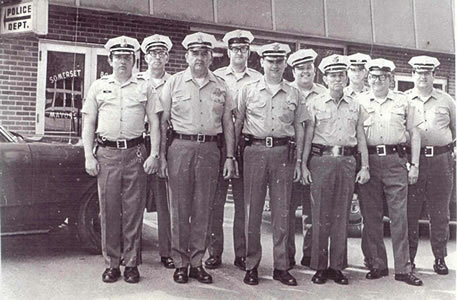 This photograph of Somerset Police officers was taken in front of their new office at 340 West Union Street, probably in 1971 or 1972. At the time, officers wore light gray shirts, medium gray trousers, and white 8-point cap. The officers are, front row from left, James Hahn, Chief George Jock, Lester D. Lensbouer, Albert Putman, and Harold D. Hoggard; back row from left, Alfred C. Brocht, Guy Davis, Anthony McKenzie, Lloyd W. Zerfoss, Jr., and Bernard Schardt. This photo appeared in the Daily American in early 1975. Lloyd Zerfoss is shown wearing the new brown and tan uniform that officers started wearing in the winter of 1974 - 1975. It was the department's uniform until 1998. This is the Keystone Patch that was adopted for the brown and tan uniforms. This version of the patch shows a stylized eagle that was a redesign done about 12 years after the original patch was adopted in 1974. 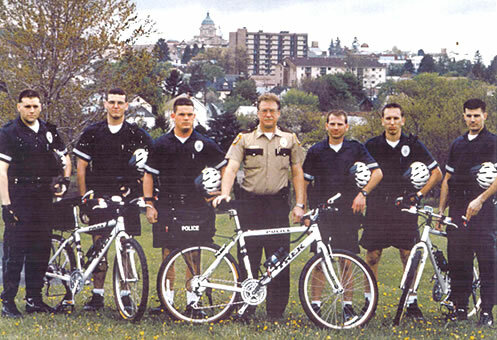 In 1988, the Department started its own Bicycle Patrol Unit, which was the first such unit in Somerset County. 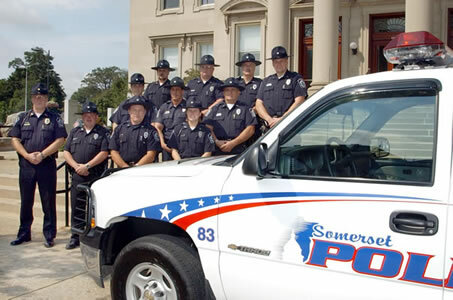 This 1998 photograph was taken of the first six officers to be assigned to the S.P.D. bike unit. Officers are, from left to right: Christopher Gigliotti, Albert Graham, IV, Ron Smuch, Chief Brad Cramer, Regis Sanner, Steve Borosky, and Patrick McGuire. The first Trek police patrol bike was purchased for the Department by the local Aerie of the Fraternal Order of Eagles. The officers wear special biking patrol uniforms and are required to have certified training in the operations of police bicycles. 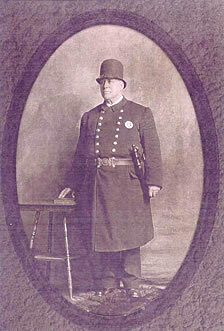 This is a photo of chief Brad Cramer, O.I.C. 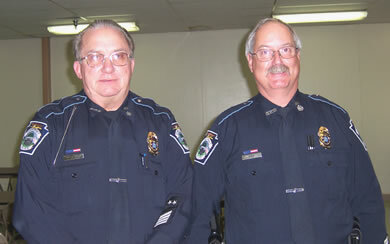 James Hahn, and Officer Jeff Ely in 1998 when the department adopted the dark blue uniform. The first Officers in Charge. Left Jim Hahn, right Cliff Pile. 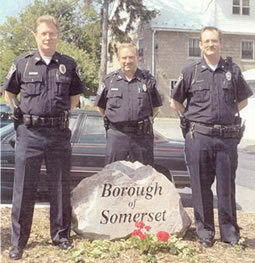 These are some of the members of the Somerset Police Department in 2003. The photo was taken on the steps of the Somerset County Courthouse. This is the design of the Bicentennial Badge inscribed with each officer's name. 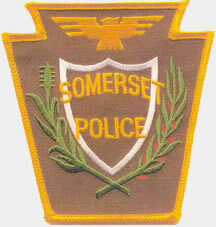 These Badges were purchased for officers by the Somerset F.O.E. and worn during the year 2004, for the Borough's Bicentennial.